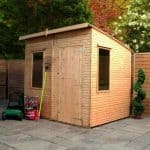 If your storage needs are vast, this 10’x8’ Shed-Plus overlap workshop shed is the perfect choice. 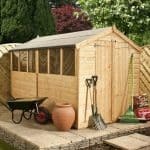 Designed more with affordability in mind, this shed is a basic model that is reliable and easy to maintain. Though advertised as a workshop, you will need to spend a little extra money upgrading the floor yourself to ensure it can hold heavy equipment. An apex roof gives the shed superb interior height, though it has a slightly gentler slope than a lot of other comparable models. Made from overlap, the shed has a rough appearance that can be enhanced with coloured treatments. It has been manufactured from softwood and one benefit it does offer is that the walls have been dip treated at the factory to protect it throughout shipment. It comes with very wide double doors which allow you to get all kinds of storage in and out of the building with ease. They also feature the popular and sturdy ‘z’ bracing which protects the doors from sagging through constant use. One of the main features of this design is the large styrene glazed windows which can be assembled on either side of the shed. It also benefits from a great 10 year anti rot warranty. Both the interior and exterior of the shed have been constructed from basic materials. This helps to keep the cost down, but it does mean the floor won’t be capable of handling heavyweight storage and the overlap walls will need to be maintained more than a Shiplap tongue and groove clad shed. This huge overlap workshop is part of the Shed-Plus collection and it is capable of holding a wide range of storage. The floor will need to be improved if you want to store heavy machinery however, but this is fairly straightforward to do. It comes with an excellent height and the door height is also impressive compared to many other models. However, the width of the double doors is shorter than what you’ll find on a lot of competitor buildings. Though a very common apex roof style is used on this workshop, it does have a gentler slope than a lot of its competitors. So this means it offers a slightly different look. The only real downside to the roof is that it is constructed out of solid sheet materials and covered with a fairly basic felt. Roof joists will boost its strength, whereas a better quality felt could be added separately if preferred. What is interesting about the floor’s design is that rather than use the common OSB material, instead it uses MFP. This is a slightly more stable and solid material. It still isn’t anywhere near as strong as tongue and groove, but it does mean compared to standard solid sheet floors, this one is designed more with heavier use in mind. We would still suggest strengthening it further if you want to use it as a workshop however. There are different types of overlap cladding that can be used and the manufacturer has been sure to opt for the highest quality, traditional square cut variety with this workshop. It still provides the rustic, rough sawn look that is typical of overlap buildings, but the 8mm thick walls are both reliable and durable when treated regularly. A 28mm x 28mm frame is also a standard feature found in the majority of wooden buildings. One thing that is different about this shed’s cladding is that it comes dip treated. This is pretty unusual for an overlap building and it basically gives it a weather-proof coating on the surface of the wood to stop it from getting damaged whilst in shipment. Annual treatments need to be maintained in order to benefit from a 10 year warranty against rot. Double doors have been added which is common on buildings of this size. 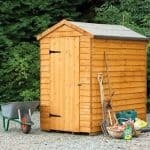 However, they do have slightly shorter measurements than the average shed door. This doesn’t really make much difference as you are still left with a wide entry space allowing you to transport wide machinery and equipment into the building quickly and easily. One of the features we like about this building is that the doors have been braced. Like the dip treatment added, this is actually pretty unusual to find on an overlap building. So that you can see what you are doing inside the shed, four large styrene windows have been added to the side. It also benefits from interchangeable sides which means you have the choice to install the windows on whichever side of the workshop you’d prefer. It’s great to see that a pad bolt has been added to the workshop as it means you can easily padlock it to keep your contents secure. A padlock isn’t supplied so this will need to be bought additionally alongside the building. The lack of privacy however is something you cannot do anything about. Tongue and groove Shiplap clad buildings are strong enough to have nails and hooks hammered into them. This isn’t the case with overlap so you won’t be able to add any window coverings. Out of the four extras and customisation options available, we think three of them are definitely worth investing in. First up you have the DIY treatments. As it is incredibly important to make sure you treat overlap sheds regularly, these treatments should be considered an essential investment. They are very affordable and provide protection for around a year. What makes them so unique is the fact that they are made with rough-sawn timber in mind. Available in two colour variations, these 5L tubs give you the opportunity to change the finish of the shed. They are also quick drying and suitable for use around pets and plants. The pack of 4 shed hooks is also worth looking into. Overlap may be a lot cheaper, but it is also a lot weaker. This means it isn’t suitable to attach shelving or hammer hooks into the walls. These hooks on offer from Shed Store are specifically made to fit in between the overlap panels. As long as you aren’t planning on attaching anything heavy to them, they can help you to expand your storage space and keep the interior a lot tidier. There are 4 hooks in every pack. We like that you are given two security options, though personally we feel the single alarm option is going to do just as good a job as the Yale security kit so it could be worth saving your money. The difference between the kit and the alarm padlock is that the padlock has a built in alarm which sounds if it is tampered with, whereas the kit has a small padlock, a separate alarm system and a hasp and staple. Lastly there is a solar light which could actually be worth the money due to the size of the shed. It will ensure you can see your storage at night or on pretty dark days. As it doesn’t need to be installed into the mains, getting it working is quick and simple. It is quite a bright light and the fact it is powered by the sun through a remote solar panel means you don’t have to pay a penny more than the initial purchase cost. Considering this is an overlap shed, we’re surprised by its great quality design. The use of slightly thicker MFP for the floor is a nice touch and the dip treated walls are also a benefit that you don’t usually get with overlap buildings. You will need to give the shed annual treatments to ensure it lasts the 10 year anti-rot warranty. However, thanks to the quality of the building, the materials are very durable compared to a lot of other models. There is a lot of storage space provided by this shed, even considering it cannot hold shelving or hooks nailed into its walls. 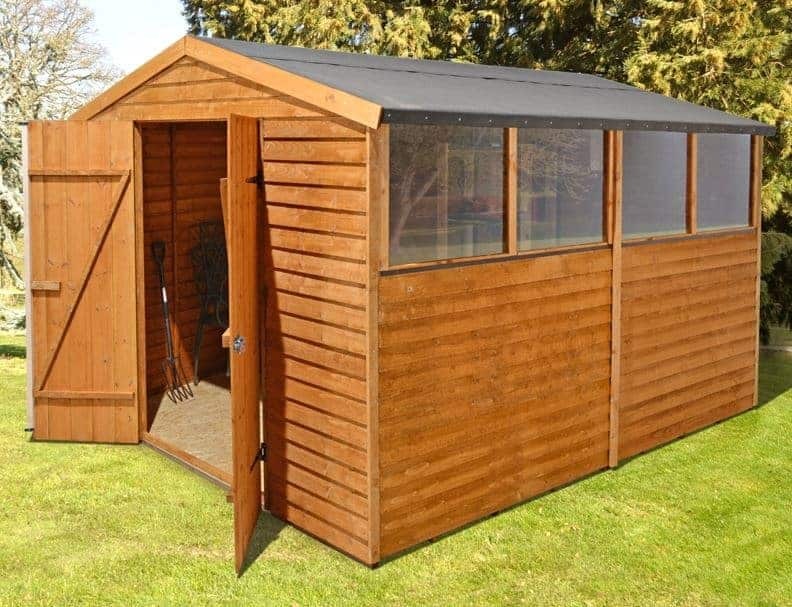 It’s a spacious shed with plenty of potential. This shed appears to be fairly easy to assemble. It’s going to take an estimated 3-5 hours to put together if you work on it solidly. 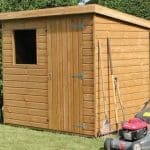 This is one of the most affordable large sheds available and the quality that you receive is pretty good in comparison. Its ease of installation and inexpensive extras ensure you are definitely getting more than your money’s worth with this building. 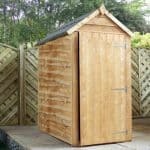 Final Thoughts: Though this may not be the highest quality shed on the market, it is one of the most affordable. Overlap is a reliable material and provided it is annually treated, it will last just as long as tongue and groove clad sheds. This is highlighted by the generous 10 year anti-rot warranty. Large styrene glazed shatterproof windows can be located on either side, allowing you to install them facing the most private part of the garden. 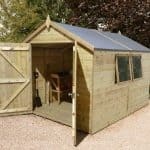 As sold the shed will only comfortably store lightweight equipment so improvements will need to be made if you want to keep heavy machinery or tools in the shed.